Once I started searching for ideas, I got a little crazy in the details. I wanted everything to be memorable for him and I wanted his friends to have a great time. 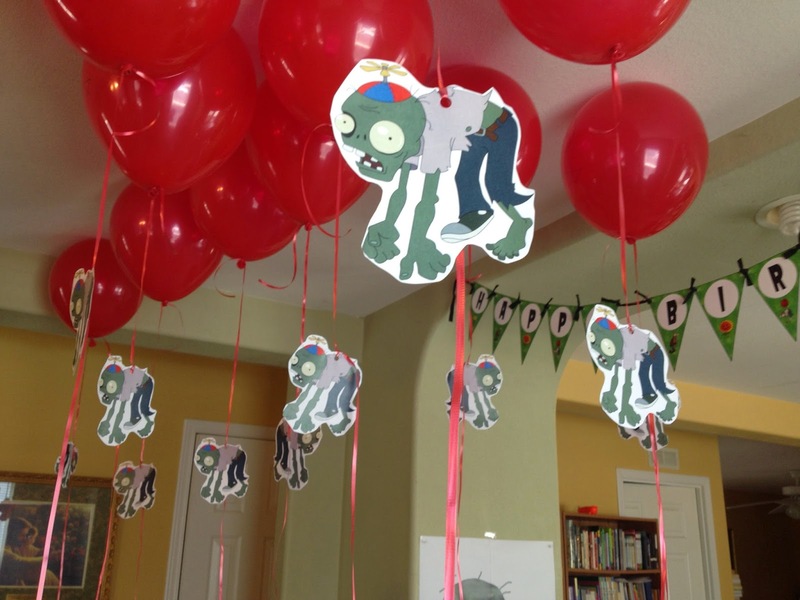 I had some zombie images blown up and printed for decoration. And I found this perfect sign for the front door. Thanks to Etsy, I was able to get ready-made digital images that I had printed at Kinko's. Then I just had to spend several hours cutting and glueing. I struggled with the cake. I had a different vision initially, but things just weren't working out, so I had to revamp and go with a simpler idea. I made the figures from gum paste a few days before, did the fondant work the night before the party, and then assembled everything that morning. 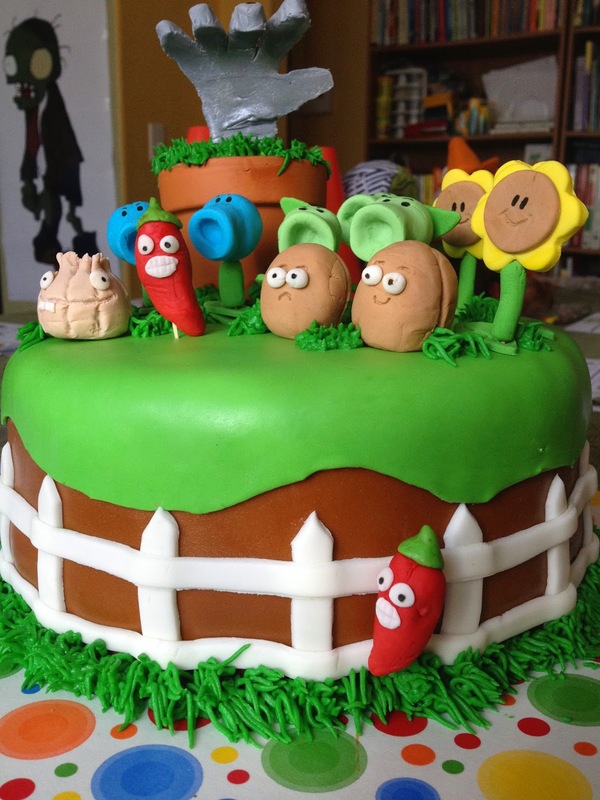 There was just no way I could make a fondant zombie, so to get around it and yet still have the zombie touch on the cake, I just went for a hand reaching out of the ground. Much easier. For decorations I bought a set of small traffic cones. 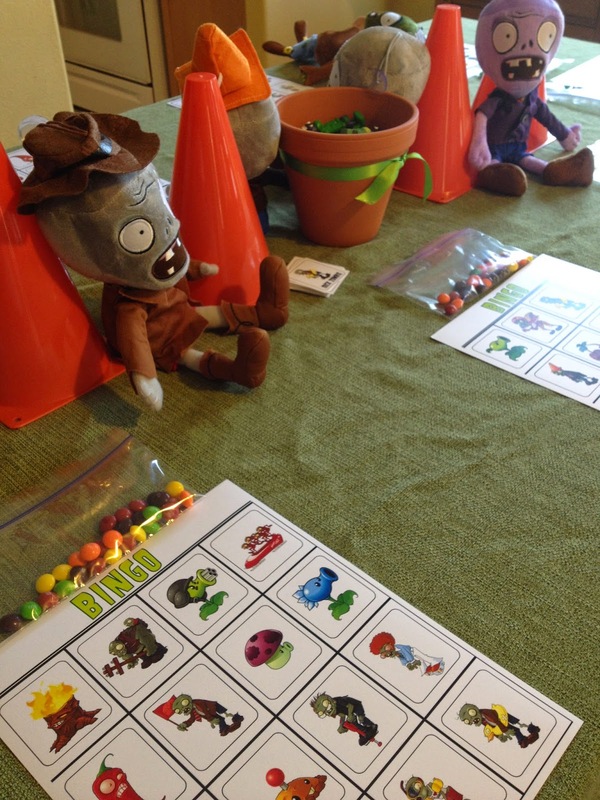 Our first game as guests arrived was Zombie Bingo. The kids loved it. Then we played Musical Zombie Chairs. We had downloaded the Plants vs. Zombies theme song onto a CD and we played that while the kids had to walk around the chairs zombie-style. Then we played Zombie Bowling. Everyone thinks it's going to be so easy, but it's not! We gave each child three tennis balls to try and knock all the cans down. Only one child got them all down with the first ball, and only two were able to get them all down with three balls. They loved this game! Next up was Pin the Eye on the Zombie. I ordered five of these zombie stuffed toys from China (cheap!) to use as first prizes for each of the games. The kids loved that! 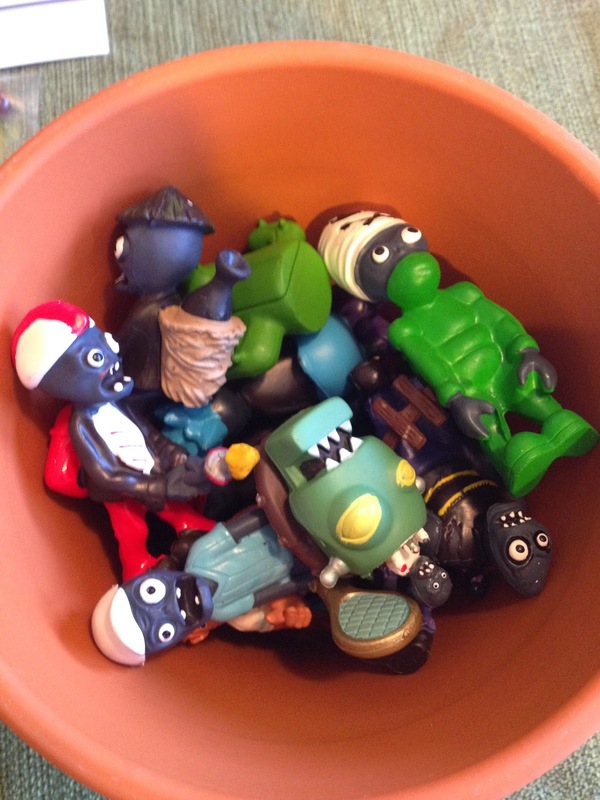 Then I had a terra cotta pot filled with smaller action figure type zombies that served as second and third prizes. The last game was a Zombie Shooting game. 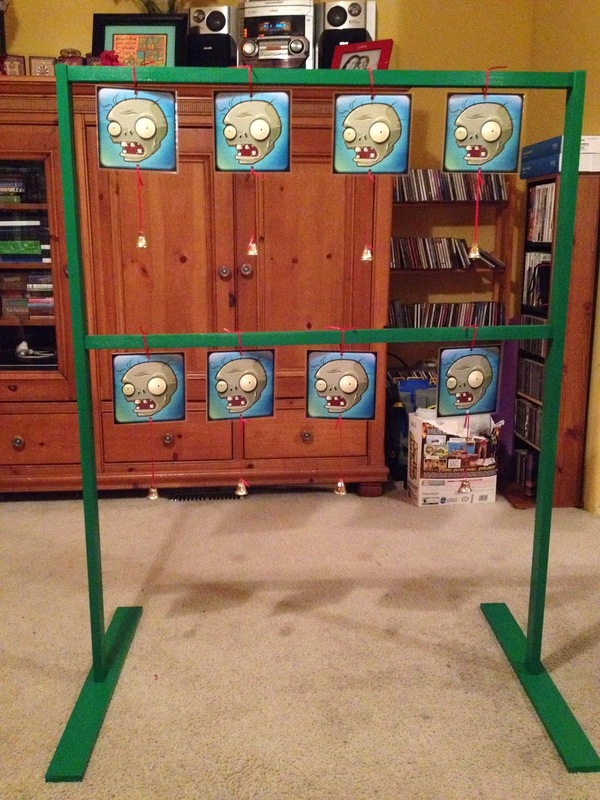 I printed out images of zombie heads and laminated them and hung bells from the bottoms. Aiden built the frame for me and spray painted it. This was an outside game. The kids got ten marshmallows chances to hit the zombies. Then it was inside for food. I had the party from 2-4pm, so I didn't need to serve lunch. 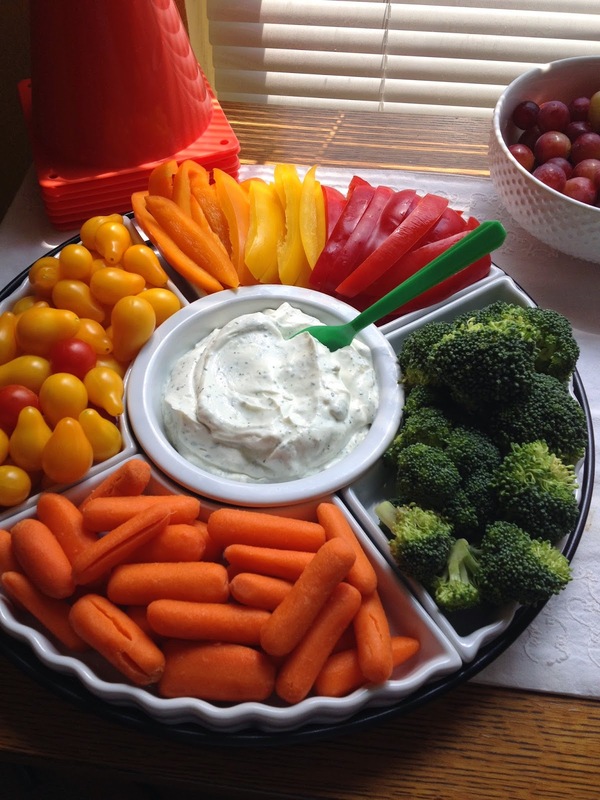 But I had snacks, which the kids actually munched on throughout the whole party. 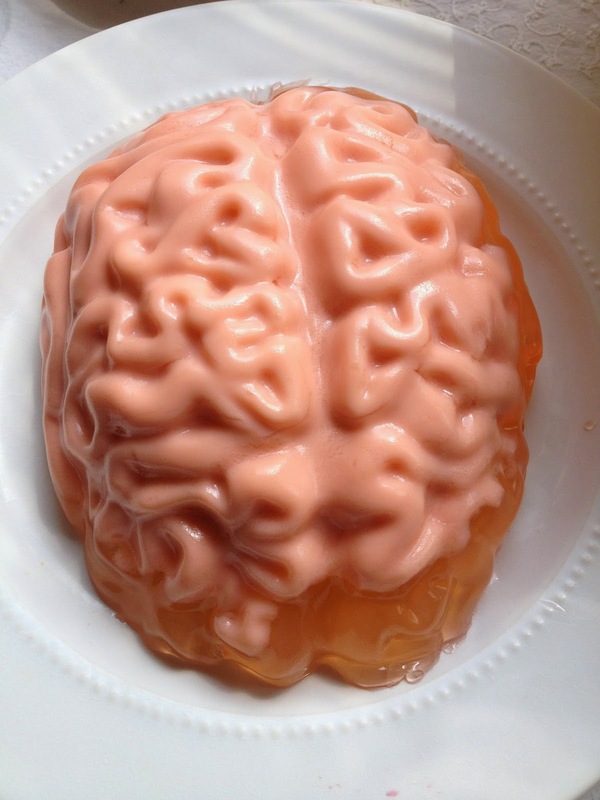 We had a little "brain snack" after a few of the games and the little zombies ate their jello brain. 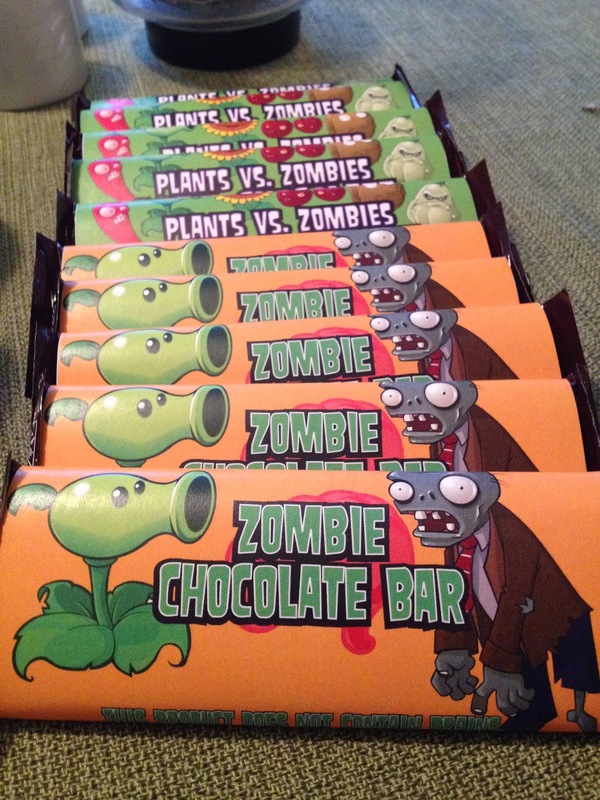 Plants for the little zombies! And then it was cake time! I can't believe this boy is turning 8! I made one of the traffic cones into a party hat for Conor (and clipped a tie on him like a zombie too, which you can't see here). And then they demolished my hard work! Cards and gifts at the end. 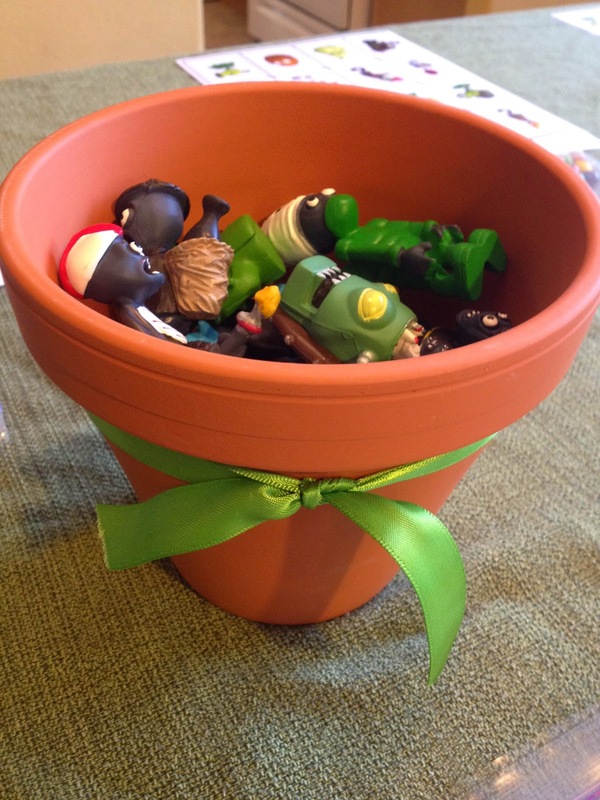 and put them inside flower pots along with a pack of trading cards, bubbles, and a pack of sunflower seeds to grow in their pots. There were supposed to be eyeball gum balls too, but something happened to my order. Oh well, nobody knew. And hopefully parents were happy that the kids didn't come home laden with sugar. 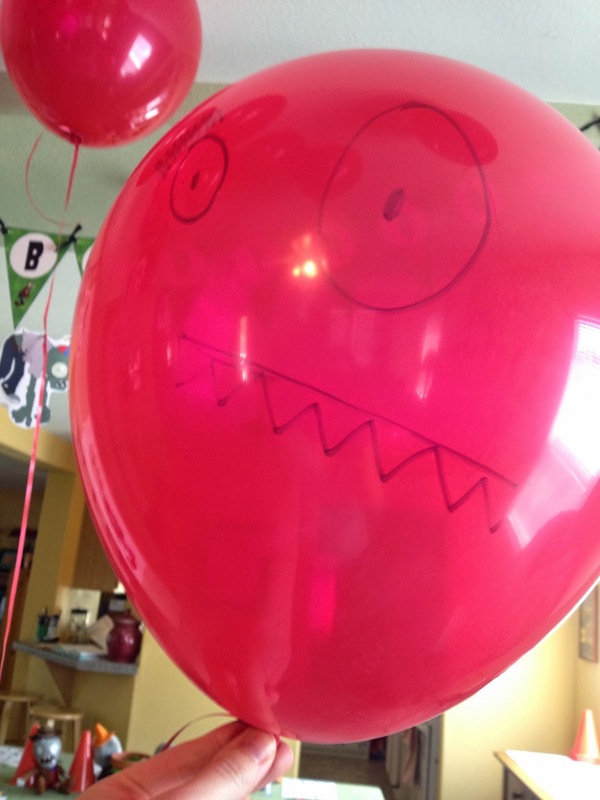 Conor was incredibly thrilled with the way his party turned out. Parents have been telling me how much fun all the kids had. All of the games were a success. 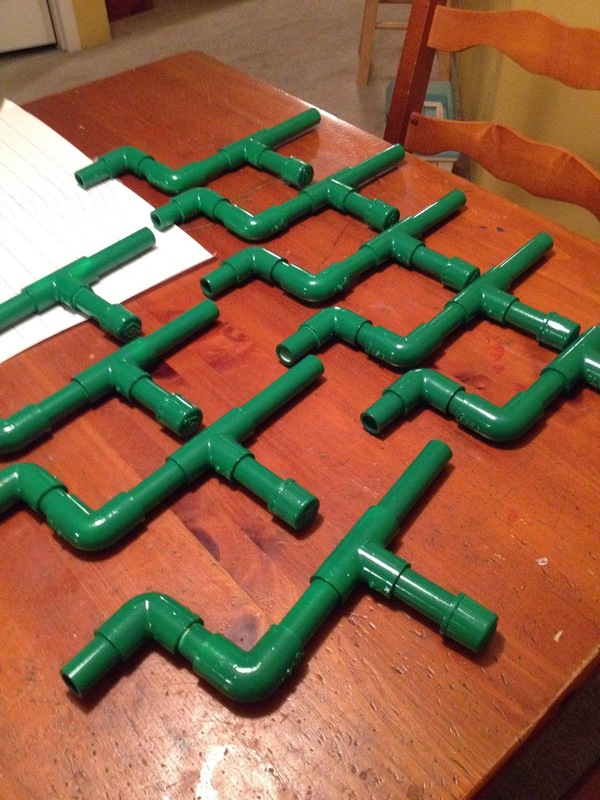 The kids would always ask to play them again when we finished. It was a ton of work getting everything ready, but all worth it! One day I hope to throw a party half as cool as the ones you throw. 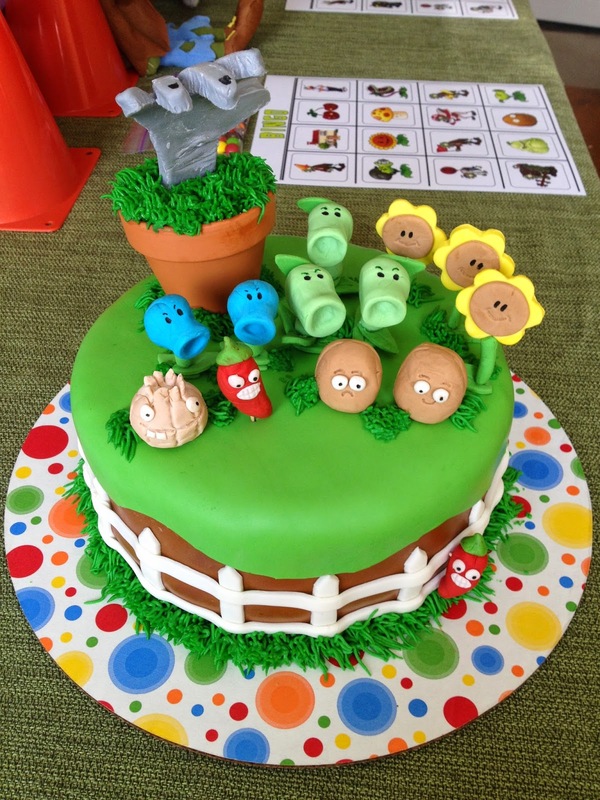 If you ever take a break from piano lessons, you could probably work on the side as a party planner! No joke. I'd hire you in a heartbeat. I can't believe Conor is 8 tomorrow. It's great to see him grow into a smart, talented and sweet boy. Love you guys!!! You should be a party planner! AMAZING!!! Love all the details! Great idea holiday !! super// super!! You are so clever !!! Congratulations on the birthday !!! Happiness, health and good luck !! If you do not mind, would like to take your idea of a holiday !! My son is 6 years old soon !! You are amazing...what a wonderful party of activities and favors. 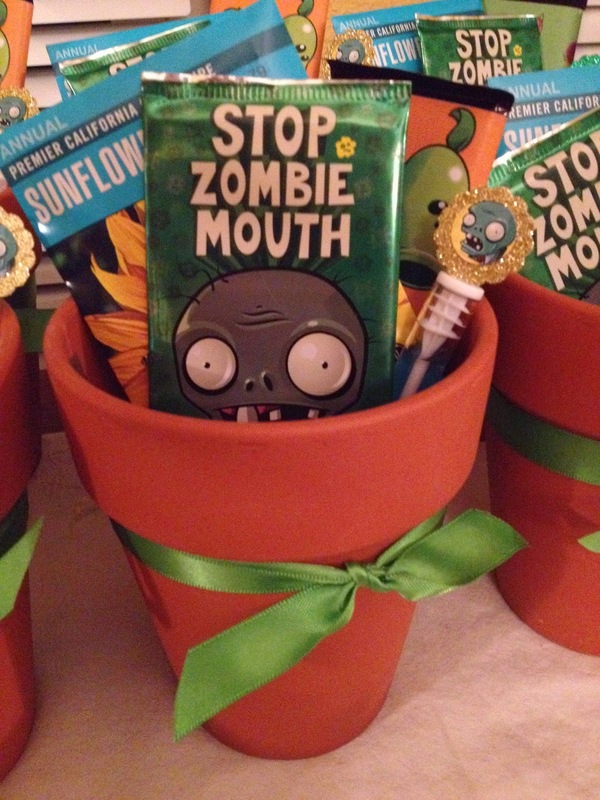 Here is one more The Zombie Plant Growing Kit or Party Favors allow you to grow a plant that will play dead when touched and then come back to life. My kids and students love them. You can find them on line....you will never look at plants the same way! Help, I'd love to know. Hi, Amy! I wish you lived locally to me, because I've been trying to get rid of all my party stuff to a good home! I found all the printable things (banner, candy bar wrappers, bingo cards, etc) from Etsy. And the trading cards I happened to find on Ebay! Good luck with your son's party! Do you have a link for your plush toys? By "cheap" are you talking $4 each, $2 each, $7 each?